← What would you name your resort? The beginning of the twentieth century brought dramatic changes to tourism in Minnesota. The reasons? The emergence of continuous highways with uniform signage. This, coupled with the rapid development of the automobile industry, allowed the middle class traveler to escape the limitations and dependency on railroads. With improved highways and affordable automobiles, the average citizen could now visit distant places at their own pace, in their own space. Early highways (“auto trails”) had names, rather than numbers. The name identification had evolved informally, and routes were difficult to find and follow on a map. After the Minnesota Department of Highways was established in 1917, trails, were required to be registered. Just about any highway or auto organization could apply for registration by describing the route and giving it a special name. A requirement was that a symbol or lettering be painted on signs and posts to keep travelers on track. Some of the trail routes started and ended within Minnesota, while others crossed Minnesota as well as other states. Some became important; others faded before the ink of registration had dried. By 1920 there were over twenty auto trails officially approved by the state. I have divided them into four types: international, transcontinental, interstate, and intrastate. The first three will be covered in this post; the last, intrastate, will be covered in a later post. The Jefferson Highway is considered by many as the United State’s first international highway. It started at New Orleans, Louisiana and ended at Winnipeg, Manitoba. It was officially registered in Minnesota on August 9,1917 by the Jefferson Highway Association. This route was already in use in 1916. It incorporated about 500 miles of the Inter-State Trail to Kansas City, Missouri. A short stretch of it is included in the Lake Country Scenic Byway. The trail went across the United States from the Gulf of Mexico to the Canadian border through Grand Marais. It entered Minnesota near Elmore, then went north to Blue Earth, Mankato, Shakopee, and the Twin Cities. Parts of this trail later became US 169. It was approved in Iowa in January of 1917, but no official document was found for Minnesota. This highway, over 4000 miles long, was organized in February 1919 to connect Portland, Maine with Portland, Oregon. It was proposed in Minnesota on March 11, 1919 and recorded on March 17, 1919. It entered Minnesota at Duluth and exited at East Grand Forks. In 1920 it became Minnesota Highway 8 and in 1926 US Highway 2 when the United States began the US numbering system. This trail went from Seattle, Washington to Plymouth, Massachusetts. 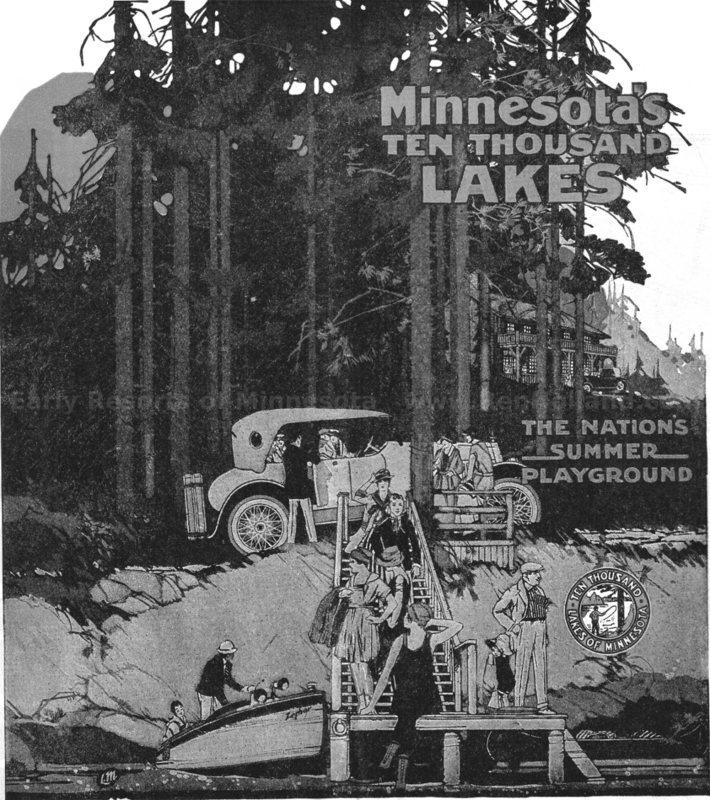 It was registered in Minnesota on July 26, 1917 by the Yellow Stone Trail Association. From the east line of Washington County, near Lakeland, it exited the state at the west line of Big Stone County, near Ortonville. Most of the route between St. Paul and Yellowstone Park became part of US 212 in 1926. This trail application was submitted by the Chicago-Black Hills and Yellow Stone Park Association. It was registered on August 10,1917 and connected Chicago, Illinois with Yellowstone National Park. It entered Minnesota at La Crescent, then went north to Winona, west to Rochester, Mankato, Tracy, and Lake Benton, reaching the west line of Lincoln County. This route became US Highway 14 in 1926. Registered on August 2, 1917, this route was sponsored by the Red Ball Route Association. Starting at St. Paul, it went through Rosemount, Farmington, Northfield, Dundas, Faribault, Medford Owatonna, Blooming Prairie, Austin, and Lyle to its termination at St. Louis, Missouri. This route was registered on April 24, 1918. It started at St. Paul, then went through the counties of Ramsey, Hennepin, Wright, Meeker, Kandiyohi, Meeker, Swift, Pope, Stevens, Grant, Traverse, and Wilkin, exiting at Breckenridge, Minnesota, and ending at Glacier National Park. This route may have originated in Missouri. It went through Iowa, and entered Minnesota north of Spirit Lake, Iowa, at Jackson. It went to Windom, Olivia, Willmar, New London, Belgrade, Sauk Centre, Long Prairie, Wadena, Park Rapids, Itasca Park and Bemidji. A large part of it later became US 71. The registration date was not found, however, it is shown on a 1923 Minnesota highway map. Although auto trail names were registered into the 1930s, they began to lose their importance, and soon disappeared under layers of route numbers. Today however, a revived interest in auto trails has led to creative adventures and activities in communities along the original routes. In future blog posts I hope to add more information about auto trails, as well as the colorful identifying signs associated with them.